Salmon patties and Grilling Salmon. 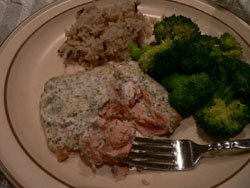 I typically will have baked salmon at least once a week, as it is quick and easy to prepare and clean up. 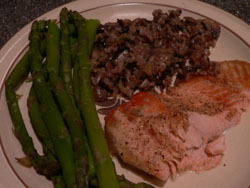 How to cook salmon and knowing when to stop cooking is very important to the flavor and texture. I have had over cooked salmon in restaurants so many times that I prefer to cook it at home now. The trick is to remove from heat before it is at the flake stage. Most fish taste best when they flake and are opaque but not salmon. The best way to tell is to stick a folk in the thickest part. Salmon tastes better when center is still translucent. And remember it will keep cooking once removed from the heat. 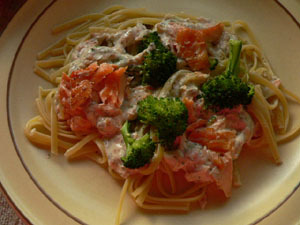 Pasta recipes with fresh seafood are complete meals when served with a vegetable such as Broccoli or asparagus. Salmon is high in Omega-3 Fatty Acids and Vitamin D. If you would like to learn about the numerous other health benefits of eating salmon, check out Wild Caught Salmon. 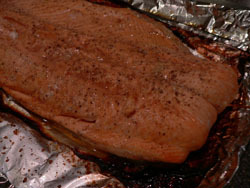 Place salmon on broiler pan that has been prepared with a cooking spray. Season with salt, pepper and lemon. Put in oven and bake for 20 minutes. While fish is baking cook the fettuccine as directed on package. Drain and set aside. Mix yogurt and flour in saucepan. Stir in dill and horseradish. Heat over low heat until hot, but do not boil. Take the baked fish and flake into chunks. Stir chopped cucumber, broccoli and fish into sauce. Put fettuccine on serving platter, pour sauce over fettuccine. TIP: Use a sheet of tin foil, crimping up the sides to make a disposable pan for quick and easy clean up. Preheat the broiler. Place salmon skin side down on broiler pan that has been prepared with a spray. Season with salt, pepper and lemon. Broil 10 to 15 minutes. Using heavy duty tin foil, make a disposable pan large enough to have an inch space around the salmon filet. Place salmon skin side down in foil pan. Season with salt, pepper and lemon. Place sprigs of dill on top of filet. Spread onion over the top and finish with the pats of butter. Place the foil pan with salmon on grill grate and tent another piece of foil over the salmon. Close grill cover. Grill for 20 minutes. No need to flip but if fillet is not even thickness you may want to rotate it 1/2 way through as some grills have hot spots.